The following pictures show a progression from ash log to dart shafts in a project I did with students from Mercyhurst College in North East Pennsylvania. This method may yield 20 to 50 shafts from a small log about 6 inches in diameter. 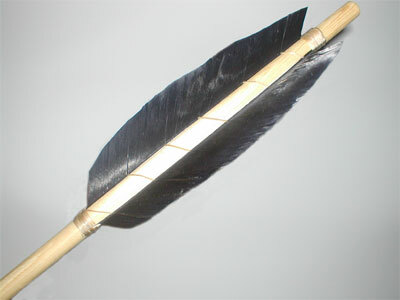 Ash is my favored dart material for hunting and fishing. This experiment was done with stone, antler and wooden tools to show that Native Americans had the technology to make dart shafts easily from trees. It took 2 hours to get to the point where we stopped because of darkness, but we had made several darts. I think two people working together could make a year�s supply of hunting darts in a few days using this method. If the shafts were stored in a lodge where they were dry and exposed to smoke they would become nicely seasoned in a matter of weeks. Fire hardening makes them ready for use immediately. These are not exactly in order but I think you can see how it was done. Bone a shoulder of atlatl-harvested venison and cube it. Dredge the cubed venison in egg then coat with brown bread crumbs. Set aside. Boil a half-cup of barley in two cups of water, stir, cover and let stand for 20 minutes. Cube a rutabaga or several turnips; slice a pound of parsnips into narrow strips. Ring two or three onions and crush a half a dozen cloves of garlic. Fry the garlic in a dash of olive oil. Add the onions, and parsnips, then the rutabaga or turnips. Don�t spare the olive oil because the venison is generally fat free. Don�t over cook the vegetables. In a large iron covered pot, saut� the venison until it is just browned but pink on the inside. Add the vegetables, barley, freshly crushed peppercorn, a dash of sea salt and a cup of red wine. Cover the pot and let simmer for 20 minutes. Serve with fresh brown bread and butter. This goes well with a hearty burgundy. Practice your French after the second bottle of wine. 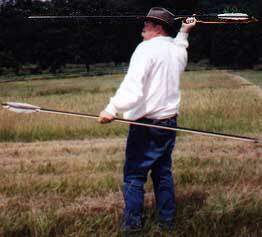 A properly made dart is the most important part of a spear throwing set. These instructions will take you through the process step by step. Wooden shafts available from Thunderbird are made from straight grained hardwood. However, even the straightest grained wood may need a little straightening. This is accomplished by simply bending the shaft in the opposite direction of the bend. This is most easily accomplished when the dart is relatively new. After several months the shaft will season in and become harder to straighten without heating. If this is the case heat it over a heat source such as a kitchen stove and carefully apply pressure in the opposite direction of the bend (be careful not to burn the wood or your hand). I recommend the use of thick leather gloves for this procedure. Apply light constant pressure, checking often to see if the shaft is straight. The heat will allow the fibers on the inside of the curve to stretch and the fibers on the opposite side to compress. Cooling will allow the wood to “set” and remain straight. Be patient and work back and forth over the full length of the shaft until all the curves and bends are straightened out. Be careful to not char or burn the wood. The tip of the dart is already tapered for the field points enclosed in your kit. The top of the dart is also finished for using it with your atlatl. Finish the shaft with a waterproof wax or oil. Avoid finish at the tip and where the feathers will be glued or plan to scrape it away before glue is applied. The best adhesive to apply the field tip with is “amber” hot glue, used in a commonly available hot glue gun. Put the hot glue on the wood, turning the dart shaft to apply it evenly. Heat the field tip at the open end , enough to melt the glue when it is applied to the tapered end of the dart, turning it almost as if you were tightening a screw. The glue will set when it is cool. Wait until the glue is totally cool to the touch before casting it, or you will loose the tip. Do not put the glue into the hollow part of the field tip first as the glue will harden before you can attach it to the wood. Bob Berg With Several Finished Darts. Here is the result of several hours of dart making by Bob Berg. Two of these shafts were painted black.